Millefeuille of crepes with candied orange and Grand Marnier sauce – a dessert to succumb to. 4 organic oranges Wash the oranges. Cut them in half and extract the juice. 300g Arcacia honey Add water to the orange juice to obtain 500ml of liquid and put this in a pan. Set aside. Meanwhile, remove the surplus pulp from the oranges and using a sharp knife, cut the peel into fine strips lengthwise. Set aside. Bring the orange juice-water mixture to a boil over medium heat. Skim, reduce the heat and add the sliced peel. Let simmer 20 minutes. Low heat / 25 min Add 180 ml Grand Marnier and let simmer another 5 minutes. Remove from heat, let cool and keep in the refrigerator until the next day. 120 gr butter Over low heat, melt the butter in a small pan. Let cool before using. a pinch of salt In a mixing bowl, mix the flour, sugar, vanilla sugar and salt. 125 ml lager beer Add the eggs, milk and beer. Mix well. 1 sachet baking powder Then add the melted butter and baking powder. Puree with a hand blender till creamy and smooth. Rest in refrigerator/ 1 hr Let the batter rest in the refrigerator for 1 hr. 1 tsp butter per crepe Melt a small teaspoon of butter over high heat in a non-stick frying pan with high rim (without burning the butter). Spread the butter around the pan with a paper kitchen towel. When the pan is hot, put a ladleful of batter into the pan and swirl to cover the entire base and side. Let cook 1-2 minutes before turning the crepe over using a spatula. Then let cook the other side for a further 1-2 minutes. High heat / 1-2 minutes per side The crepe is cooked when it is golden. 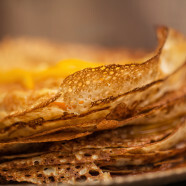 The edges should be paper thin, crispy and fragile and the center of the crepe soft. Preparation / 25 min Put the finished crepe on a platter. Sprinkle with 2-3 Tbsp Grand Marnier scented orange juice making sure that the edges are not moistened. They should remain crispy. Scatter 1 Tbsp orange peel over the crepe. Procede in the same manner with the following crepes until there is no more sauce or orange peel. Serve within the following hour by cutting pieces of cake.